We are almost in the end of the A-Z series in journey through Cuisine in mega marathon and today is letter X.As there is no ingredient or dish starts with X,need to use English word.So decided to make this (e)xtra spicy and extremely easy to make garlic chutney. This chutney is often made when there is no accompaniment for the left over idlys.This chutney tastes so good with chutney and end up in eating (e)xtra few idlys.Usually this chutney is ground in a stone mortar(grinder) and it will be in a thick consistency.But with the mixie it is bit hard to get a thicker consistency. Take the red chillies,tamarind and salt in a blender jar.Powder it for a minute.To this add a tbs of water and grind it to a smooth paste.Now add the garlic and tomato to it and grind it.. Transfer the chutney to a bowl.Now heat a small with sesame oil and once it becomes hot,pour it on the chutney.Mix it well and serve. A yummy side dish for garlic lovers. 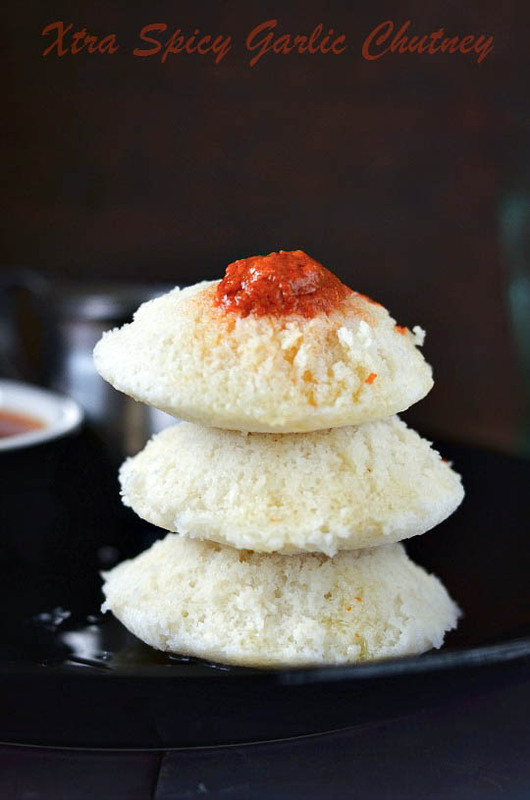 love that stacked idly pic.. chutney looks super spicy. Omg, wat an alluring chutney, looks absolutely irresistible, my mouth is watering here. Yummy xtra spicy and xtra quick garlic chutney. 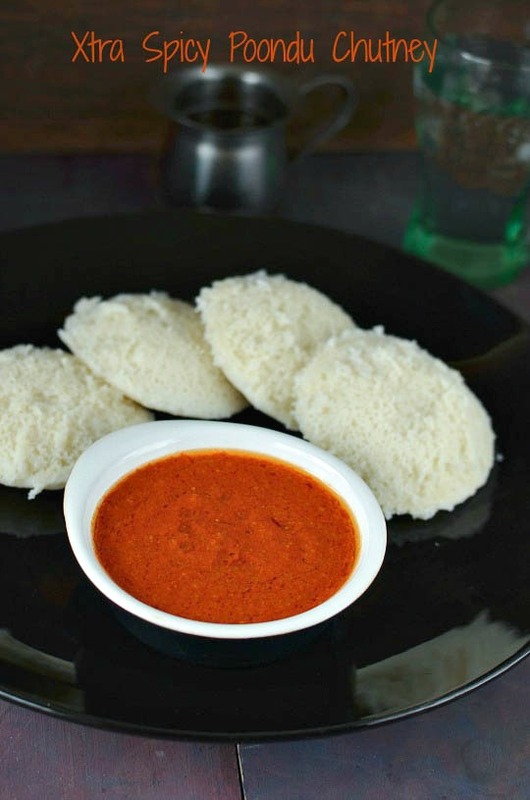 Love that red color of the chutney and is very inviting. 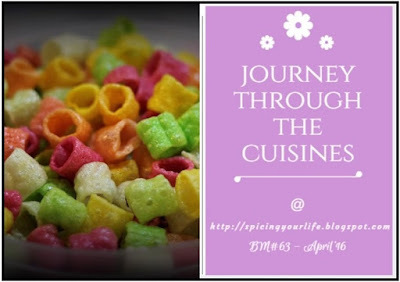 The pictures are stunning Nalini..too good..I love all such spicy chutneys.. Awesome spicy chutney, Nalini. 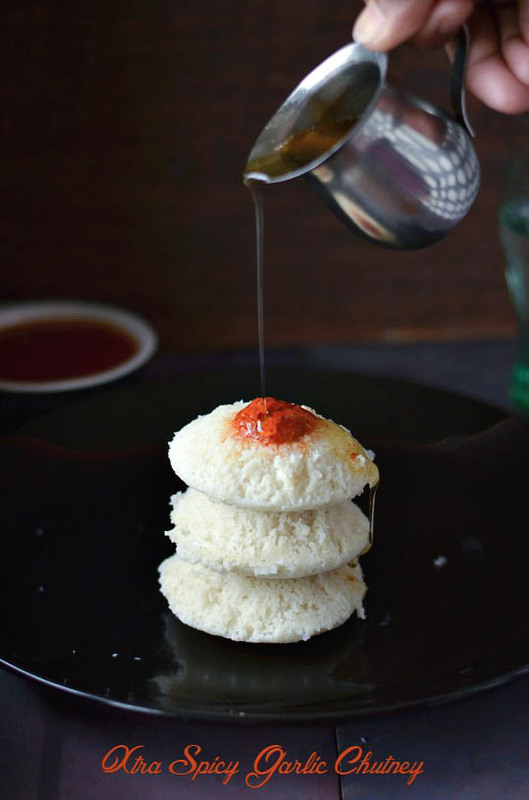 Looks so delicious with the idlis and sesame oil..
Love the stacked Idli's pic where you are pouring ghee. Chutney looks delicious. Omg that is one spicy chutney you have got there. Amazing clicks Nalini. 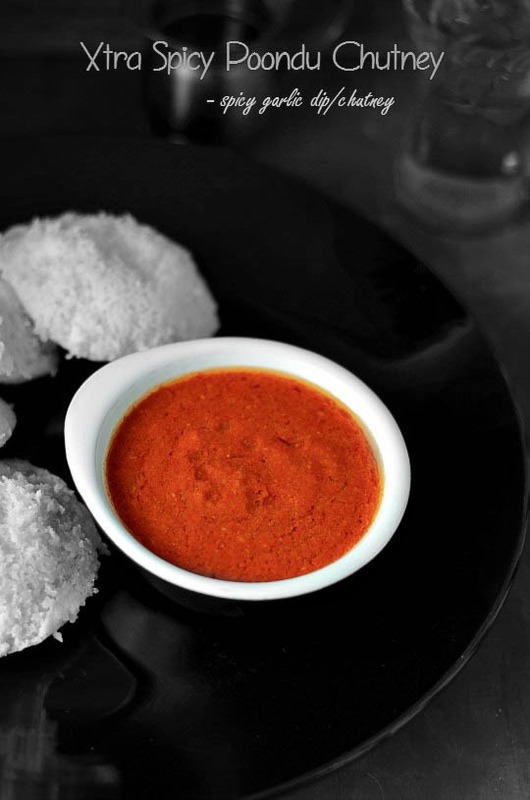 Garlic chutney looks spicy & yummy!! My husband will love this fiery looking garlic chutney. Nice and interesting chutney recipe you have there! Awesome clicks too Nalini!